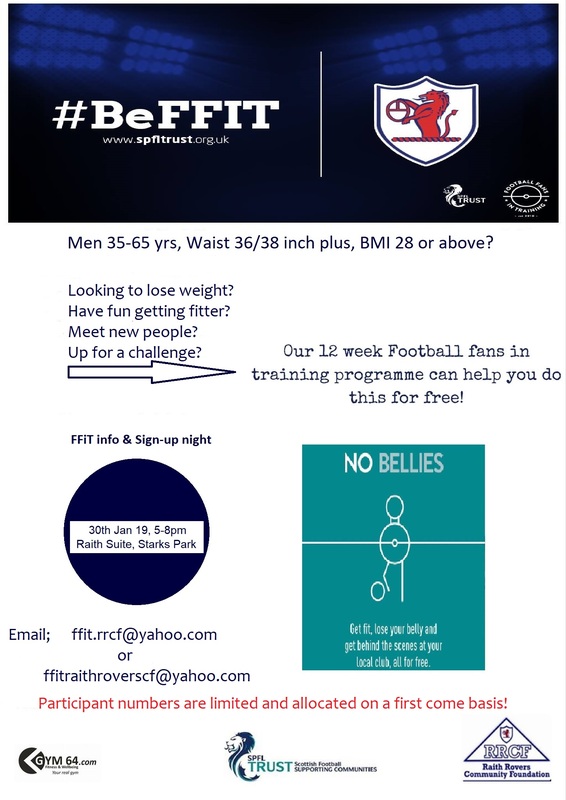 Raith Rovers Community Foundation is looking for men aged 35-65 years old with a waist size of at least 36 inches or above. The 12 week Football Fans In Training programme can help you lose weight, have a healthier lifestyle and ultimately be fitter for free. You’ll get a behind the scenes look at your club, be trained by selected club coaches, have a look in the Boardroom and have the chance to talk tactics in the dressing room. Who knows, maybe you’ll even bump into a player or two. So what are you waiting for? The sign up night is on Wednesday 30th January between 5-8pm in the Raith Suite, Stark’s Park. Please email ffit.rrfcyahoo.com for more info or to provisionally sign up.